This paper presents a rare case of TMC which incidentally detected on sagittal and coronal planes of CBCT images. A 63-year-old man presented at our department for a dental implant evaluation. The patient had no history of systemic diseases. On the routinely performed panoramic radiograph unilaterally BMC was suggested on the left side [Figure 1]. Also multiple bilateral radiopaque lesions were detected in the area of the posterior ascending ramus. CBCT images were obtained from both sides of the jaw to identify the calcifications and determine potential implant sites in mandible. Pax Uni 3D (Vatech, Seoul, Korea) was used to capture CBCT images at the following settings: 50-90 kVp, 4-10 mA, 10 seconds exposure and 50 × 50 mm FOV size. Two oral radiologists evaluated the CBCT images on the three plane of views (coronal, sagittal, and axial) using Ez3D2009 software. The density and contrast of images were adequately adjusted to clarify multiple canals. TMC was detected in CBCT images on the left side [Figure 2]. While the panoramic radiography revealed one accessory canal at the left side, CBCT images localized two accessory canals in sagittal and coronal planes. Also the calcifications were diagnosed as tonsilloliths in palatal tonsils with CBCT images. The patient was informed of the presence of that unusual structure and referred to the Department of Oral and Maxillofacial Surgery for implant treatment. In panoramic image surveys, the occurrence of BMC presence was reported to be very low and ranged from 0.08 to 0.95%. ,,,,,, On the other hand in CBCT surveys, BMC has been reported to show prevalence rates ranging from 15.6 to 65%. , These results show the limitations of panoramic radiography in identifying the occurrence of BMC. Chavez et al. suggested that during embryonic development there may be three inferior dental nerves innervating three groups of mandibular teeth and later they fuse to form a single nerve. This theory would explain the existence of multiple canals resulting from the incomplete fusion of these nerves. It can be concluded that awareness and detection of multiple canals are of considerable interest to the general dentists to avoid complications during surgery. Initial screening for the presence of multiple canals can be executed by conventional panoramic radiography. However more precise information can be achieved with using CBCT scan with high-level spatial resolution. 1. Juodzbalys G, Wang HL, Sabalys G. Anatomy of mandibular vital structures. Part I: Mandibular canal and inferior alveolar neurovascular bundle in relation with dental implantology. J Oral Maxillofac Res 2010;1:2. 2. Wadhwani P, Mathur RM, Kohli M, Sahu R. Mandibular canal variant: A case report. J Oral Pathol Med 2008;37:122-4. 3. Claeys V, Wackens G. Bifid mandibular canal: Literature review and case report. Dentomaxillofac Radiol 2005;34:55-8. 4. Punhani N. CBCT demonstration of aberrant mandibular canal. e-J Dent 2011;1:40-1. 5. Mizbah K, Gerlach N, Maal TJ, Bergé SJ, Meijer GJ. The clinical relevance of bifid and trifid mandibular canals. Oral Maxillofac Surg 2012;16:147-51. 6. Naitoh M, Nakahara K, Suenaga Y, Gotoh K, Kondo S, Ariji E. Variations of the bony canal in the mandibular ramus using cone-beam computed tomography. Oral Radiol 2010;26:36-40. 7. Karamifar K, Shahidi S, Tondari A. Bilateral bifid mandibular canal: Report of two cases. Indian J Dent Res 2009;20:235-7. 8. Naitoh M, Hiraiwa Y, Aimiya H, Gotoh M, Ariji Y, Izumi M, et al. Bifid mandibular canal in Japanese. Implant Dent 2007;16:24-32. 9. Bogdán S, Pataky L, Barabás J, Németh Z, Huszár T, Szabó G. Atypical courses of the mandibular canal: Comparative examination of dry mandibles and x-rays. J Craniofac Surg 2006;17:487-91. 10. Durst JH, Snow JM. Multiple mandibular canals; oddities or fairly common anomalies. Oral Surg Oral Med Oral Pathol 1980;49:272-3. 11. 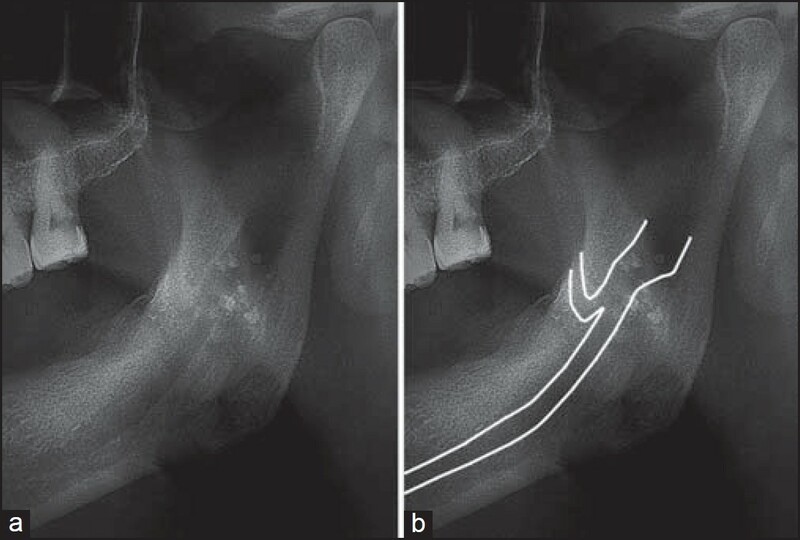 Grover PS, Lorton L. Bifid mandibular nerve as a possible cause of inadequate anesthesia in the mandible. J Oral Maxillofac Surg 1983;41:177-9. 12. Langlais RP, Broadus R, Glass BJ. Bifid mandibular canals in panoramic radiographs. J Am Dent Assoc 1985;110:923-6. 13. Nortje CJ, Farman AG, Grotepass FW. Variations in the normal anatomy of the inferior dental (mandibular) canal: A retrospective study of panoramic radiographs from 3612 routine dental patients. Br J Oral Surg 1977;15:55-63. 14. Sanchis JM, Pennarrocha M, Soler F. Bifid mandibular canal. J Oral Maxillofac Surg 2003;61:422-4. 15. Wadhwani P, Mathur RM, Kohli M, Sahu R. Mandibular canal variant: A case report. J Oral Pathol Med 2008;37:122-4. 16. 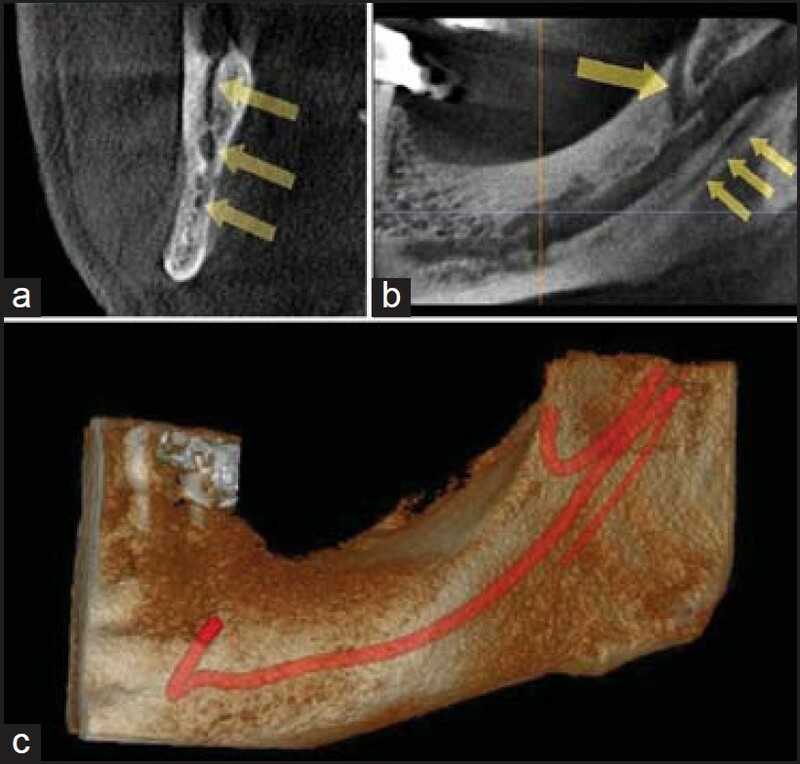 Naitoh M, Hiraiwa Y, Aimiya H, Ariji E. Observation of bifid mandibular canal using cone-beam computerized tomography. Int J Oral Maxillofac Implants 2009;24:155-9. 17. Kuribayashi A, Watanabe H, Imaizumi A, Tantanapornkul W, Katakami K, Kurabayashi T. Bifid mandibular canals: Cone beam computed tomography evaluation. Dentomaxillofac Radiol 2010;39:235-9. 18. Auluck A, Pai KM, Mupparapu M. Multiple mandibular nerve canals: Radiographic observations and clinical relevance. Report of 6 cases. Quintessence Int 2007;38:781-7. 19. Naitoh M, Hiraiwa Y, Aimiya H, Gotoh K, Ariji E. Accessory mental foramen assessment using cone-beam computed tomography. Oral Surg Oral Med Oral Pathol Oral Radiol Endod 2009;107:289-94. 20. Kawai T, Asami R, Sato I, Yoshida S, Yosue T. Classification of the lingual foramina and their bony canals in the median region of the mandible: Cone beam computed tomography observations of dry Japanese mandibles. Oral Radiol 2007;23:42-8. 21. Rouas P, Nancy J, Bar D. Identification of double mandibular canals: Literature review and three case reports with CT scans and cone beam CT. Dentomaxillofac Radiol 2007;36:34-8. 22. Boeddinghaus R, Whyte A. Current concepts in maxillofacial imaging. Eur J Radiol 2008;66:396-418. 23. Ludlow JB, Davies-Ludlow LE, Brooks SL, Howerton WB. Dosimetry of 3 CBCT devices for oral and maxillofacial radiology: CB Mercuray, New Tom 3G and i-CAT. Dentomaxillofac Radiol 2006;35:219-26. 24. Chávez-Lomeli ME, Mansilla Lory J, Pompa JA, Kjaer I. The human mandibular canal arises from three separate canals innervating different tooth groups. J Dent Res 1996;75:1540-4. 25. Lew K, Townsen G. Failure to obtain adequate anaesthesia associated with a bifid mandibular canal: A case report. Aust Dent J 2006;51:86-90.